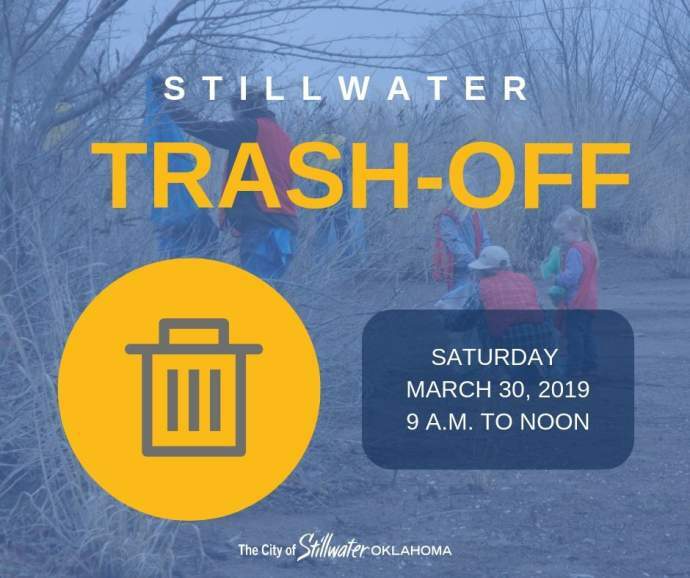 (STILLWATER, OKLAHOMA / February 4, 2019) − Residents can now sign up to help pick up litter around town at this year’s City of Stillwater Trash-Off event Saturday, March 30 from 9 a.m.to noon. Volunteers should RSVP with the number in their party by March 22 to make preparations for each group. Individuals are also welcome to participate. Volunteers will meet at 9 a.m. at the City of Stillwater Community Center, 315 W. 8th Ave. An award will be presented to the group that collects the most trash. Hot dogs and drinks will be served to participants at noon. Franks said the City will also provide work gloves, safety vests and trash bags for participants. The City of Stillwater began coordinating the annual Trash-Off event in 2006. For more information or to RSVP, contact Franks at 405.533.8482 or email cfranks@stillwater.org.